As a repair shop, auto-body or auto-glass business you need a garage to safely store vehicles, whether these vehicles are being repaired or simply kept safe. These vehicles may include cars, trucks, bikes and many other kinds of equipment and machinery that is being stored until needed or repaired on-site. Garage Liability Insurance is coverage for the different types of unwanted outcomes that can arise as a result of a business repairing vehicles or equipment. Basically, Garage Liability insurance protects your business from third party bodily injury or property damage caused by an accident that as a result of your garage business operations. This means it’s a combination of a Business Auto form and a General Liability Insurance. It helps pay for claims associated with medical expenses, liability costs and repair expenditures as a result of the incident. Depending on the industry your business operates within, the types of Garage protections you need will vary. If you are simply storing vehicles or equipment, your policy will differ from a different business policy that is protecting ongoing repairs within a Garage. Whatever your needs, this insurance can help you rest easy. Do I Need Garage Liability Insurance? Businesses with garage operations like auto repair or truck repair often store important vehicles from customers that may be expensive to repair or replace. Protecting this customers vehicles against theft, damages and replacements is a critical decision when considering the risks associated with not having insurance. Instead of worrying about unwanted outcomes, investing in insurance can provide you with peace of mind. It is covering the property of clients who have entrusted you to protect your property until it is ready to be returned to them. What Does Garage Liability Insurance Cover? Business Garage Insurance can provide your business with protection in the event that things go wrong inside your Garage. In doing so, you can rest assured in the knowledge that you have protected both yourself and your business against unwanted outcomes. Bodily Injury If someone is injured at your business garage - excluding employees - you are legally liable for their injury, including medical payments. If an clients slips and falls while entering in your business garage to get his car. Your business will be protected against the costs associated with medical or surgical treatment. Third party property damage Protection against damage to someone else’s property within your garage business. If a client’s car is damaged during the repair process you will be protected against the cost associated with replacing or repairing the car. Product Liability If you manufacture or sell products in your business garage you are liable for the faults. If you install a faulty parts in the client’s car and this results in a property damage you are coveraged against the associated costs. What Does Garage Liability Insurance Not Cover? 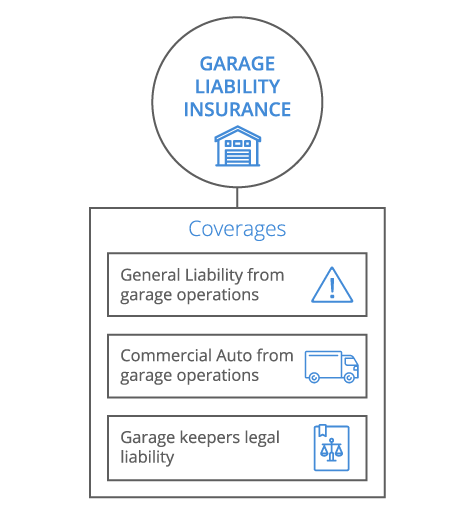 A Garage Liability policy is not going to cover injury to employees (Workers Compensation) and damage to the garage itself (Commercial Property). If your policy covers an amount less than the total value of the financial losses associated with repairs, theft, or third party bodily injury the remaining amount will not be covered. This coverage does not apply to client property such as client vehicles being repaired. In addition to this coverage, Garagekeepers Liability coverage should be added to cover client vehicles and damages caused by client vehicles. What Are the “Limits” on a Garage Liability Insurance Policy? A Business Garage policy covers specific types of protections in addition to what your general liability policy covers. Each of these protections will have coverage of a given amount. If your policy provides coverage of $1 million, then this will be the limit. As the types of coverage needed for Business Garage insurance vary greatly, each will have a different amount. If you choose a policy that does not cover the full value, then you will be protected at a given limit. How Much Does Garage Liability Insurance Cost? The costs associated with Business Garage insurance vary in accordance with the specific policy you have chosen. Each policy is created based on the industry your business operates within, the types of equipment or vehicles you repair or store as well as whether or not employees are working within the garage itself. While any business owner can invest in Business Garage insurance, your specific needs will vary depending on these different aspects. Overall, the cost will be contingent upon the type of the insurance policy you choose and how much protection it affords. You may choose a policy that includes one, several or all of the aforementioned protections, each of which have their costs. Regardless of the protections, you invest in; there is the likelihood that you will find yourself paying a premium which is a small percentage of that amount. Garage Liability vs Garage Keepers Liability - Which do I need? If your business handles customers' vehicles, you must have heard about Garage Keepers Liability and Garage Liability Insurance, and would want to know the difference between the two. To explain simply, imagine a scenario in an auto repair shop, for example, where a customer got injured when his car fell off a lift during repair. In addition to that, customer's car also got damaged due the impact of the fall. Without insurance, you, as the business owner would be liable for the damage to the car and the injuries sustained by the customer. This is where Garage Keepers Liability comes in. This type of insurance will protect you and your business if a car in your custody got damaged, stolen, or got vandalised due to your negligence. It also covers damages caused by fire or collision. Garage Liability Insurance, on the other hand, protects you and your business against third party injury as well as property damage that have occured at your shop. The insurance will pay for medical expenses and cost of repairs up to the limit you chose. Both Garage Keepers Liability and Garage Liability are necessary for auto repair shops, car detailing, valet parking, or a towing company as the former is your protection against liability for operations and vehicle, while the latter is your protection against damage to your customers' vehicles.